While at Target (where else?) 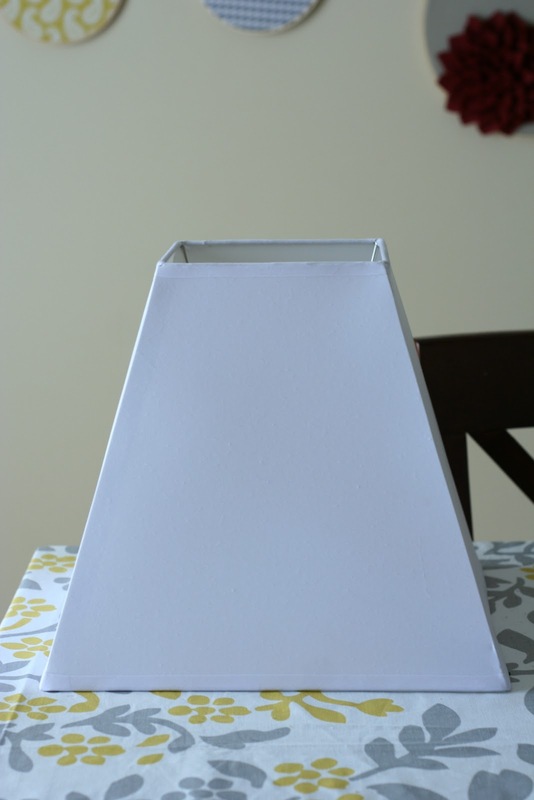 last week, I found a white lamp shade on clearance for less than $10. 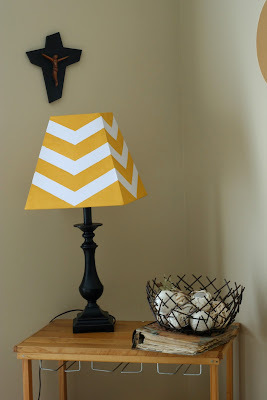 I have been really, really, inappropriately obsessed with chevron patterns as of late, and I decided that the plain white shade would become a chevron pattern with the help of some painter's tape and a little mustard yellow acrylic. Boom! I had a lamp at home that had a nice base but just a really hein-doggy shade on it. Yes. The shade was made of denim fabric. Yes. It had a pink polka-dotted "belt" around it. What of it? But the base was pretty nice. It would be the perfect match for my chevron lamp shade. So, on Saturday afternoon, I sat down and did it. Here are my steps that you can create your own as well. 1. Unwrap the white lamp shade. 'Tis a critical step. 2. Create a chevron template. This is a smidge tricky, but it can be done. I measured the top of my shade's width, which was 6 inches, and I divided it by 2 to find the middle. I knew I wanted my point to reach the exact center, so finding the middle was pretty critical to me. I made just a little dot with a pencil to mark the middle. I then took my tape, which was about 2" thick, and I just eyeballed this part. I started my chevron (which is basically a "V") with the tape and made sure that the two sides crossed at the middle point of my shade. When it looked the way I wanted, I peeled it off and stuck it to a magazine cover to use as my template. I cut the paper along the edges of the tape so that it would make my template. 3. I held my template up to my lamp, starting at the top, and then I marked the edges on the sides of my shade to show where the tape needed to be lined up. I also marked the bottom of the center point of my chevron template so that I knew to line up the tape with the middle of the shade, too. This all sounds confusing, but you'll know what to do once you start doing it. You could just trace the template on the shade, but I didn't want that many pencil lines to deal with. 4. Once my pencil marks were on the sides of my shade, I took the painter's tape and just lined them up with my markings and made sure my chevron crossed at the center point of my shade. I repeated this whole process on all 4 sides of my shade. I don't know how difficult it would be to do this with a round shade, but the 4-sided shade worked well for me. 5. After all the tape was on, the easy part was next! I painted the mustard yellow on with a sponge brush so that paint would be less likely to seep under the tape. I hate hate hate when that happens! 6. I let it fully dry before removing the tape. I was pleasantly surprised with how clean the lines stayed. Of course there are a few little spots to be touched up, but I just rotated the less than perfect side of the shade to the back. I think the key to the chevron pattern is making sure that it is exactly straight and balanced the whole way around the shade. That's why I went all nerdy with my calculations, templates, and measuring. Measure twice, cut once, fools! Did your Dad teach you that "measure twice, cut once"?